More than hundred years ago, Eli Metchnikoff was the first to discover phagocytosis by macrophages and “microphages”, today known as neutrophilic granulocytes, as a critical host-defense mechanism. Their life-saving role in combating acute infections is undoubted as wittnessed by potentially lethal diseases resulting from defects in number or function of neutrophils, for example iatrogenic leukopenia or rare diseases like the leukocyte adhesion deficiency syndrome, chronic granulomatous disease or congenital neutropenia. Historically, neutrophils were widely disrespected by researchers as gormless cells that crawl, eat and disgorge prepacked enzymes and reduced molecules of oxygen. This may have been due to difficulties in experimental approaches given the short half-life of the cells in vitro and in vivo. Recent advances in technology have put the neutrophils in the centre of interest for infection biologists and immunologists. They are the first cells that are able to recognize tissue injury and the presence of genomes other than those encodes in the germline of the individual. Central to this function is to sense injury and “non-self” by pattern-recognition receptors, to send alarming signals to activate epithelial and endothelial cells, mast cells, macrophages and platelets. As key component of the inflammatory response, neutrophils are instrumental to recruitment, activation and programming of antigen-presenting cells by generating chemokines, regulatory cytokines and through direct cellular contact. In addition, they make important contributions to the activation of antigen-recognizing T- and B-lymphocytes and are thus important decision-makers and decision-shapers for the success or failure of the adaptive immune system in serving the collective good. Some microbes like Chlamydia, Anaplasma or Leishmania are able to substantially prolong the usually short half-life of neutrophils (6-8 hours in the circulation, 15 hours in the petri-dish) by slowing-down the apoptotic program. Although the molecular basis of that interaction remains to be uncovered, it is clear that this mechanism paves the microorganisms to a silent entry into hosts cells and faciltates their dissemination through the organism. Equipped with the “licence to kill” by means of the respiratory burst, the degranulation response and the formation of extracellular traps, it is not surprising that the killing machinery leaves collateral tissue damage in acute infections (pus), but also makes important contributions to the consolidation and the organisation of the extracellular matrix in the granulomatous tissue of chronic disease states with underlying infections, autoimmune reactions or tumors. This e-book collects a fine selection of contributions from leading experts in the field of neutrophil biology in the context of infection. Their discoveries document that it is time to set aside the view that neutrophils are merely destructive cells that lash out blindly before dying. It is time to recognize neutrophils as life-saving body-guards which are in the centre of the network of the circuits that bring out the innate and adaptive immune system. Host defense to intracellular pathogens depends upon both innate and adaptive cell-mediated immune responses. Polymorphonuclear neutrophil leukocytes which belong to the innate immune system are the first cells that are recruited massively within hours of microbial infection. Neutrophils are the main players in the killing of microorganisms and recently new methods of killing including nets formation have been described. Neutrophils mediate tissue damage at infected sites. By promoting tissue injury neutrophils contribute to the initiation of inflammation, which is now recognized as an essential step in launching immunity. The importance of neutrophils as decision shaper in the development of an immune response is only emerging as they have long been considered by immunologists as short lived, non-dividing cells, of poor interest. Now, neutrophils are emerging as key components of the inflammatory response, and are shown to have immunoregulatory roles in microbial infections. In addition, neutrophils were also reported to contribute to the recruitment and activation of antigen presenting cells. Thus early interactions between neutrophils and surrounding cells may influence the development/resolution of both inflammatory lesion and pathogen-specific immune response. The impact of neutrophils on cells present at the site of infection are only beginning to be studied and deserves more attention. 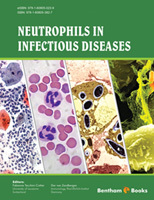 In this e-book the reader will find updated information about the role of neutrophils in the pathogenesis of 1) bacterial diseases including sepsis, mycobacteria and Chlamydia infections, and of 2) parasitic diseases including leishmaniasis and toxoplasmosis. The role of neutrophils in the protection against microorganisms has largely been underestimated and, until recently, their role was mostly thought to limited to a “kill and die” response. We will emphasize standard and advanced light microscopy techniques that allowed major advances in the understanding of neutrophil biology, through the visualization of the interaction of selected pathogens with neutrophils in living animals (Chapter 1). New neutrophil mode of killing, such as their release of extracellular traps to kill extracellular bacterial pathogens, together with several microbial strategies designed to escape NETs are presented in Chapter 2. Recent data in the field will illustrate the new role of neutrophils as orchestrators of a protective innate and adaptive immune response in bacterial (Chapters 3-5) and in parasitic infections as well (Chapter 6-7). Finally, neutrophil role as host cells and Trojan horses for parasite entry into the host will be the topic of Chapters 8. The aim of this e-book is to provide an overview of the recent advances made in the field of neutrophil biology. It will provide a basis for understanding future development that will occur in this area, and provide the reader with a short overview of some of the exciting new directions in which neutrophil research is moving.